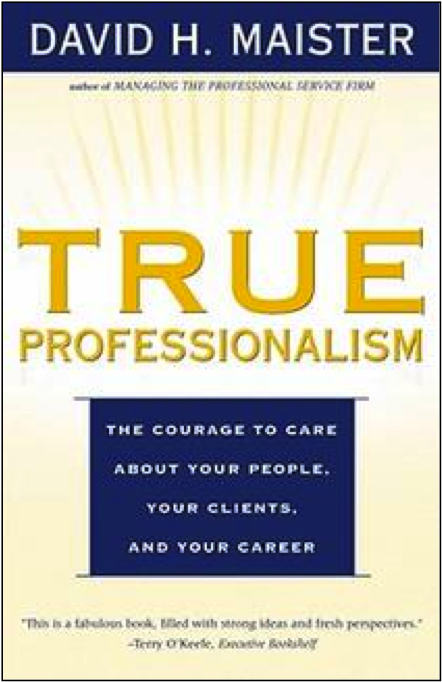 One book which has had an important influence on me, through the years, is David Maister's True professionalism. In the book David argues - apparently completely unafraid to be seen as naive or idealistic - for an ethical, ambitious, and principles-based approach to doing one's work. I have known this book ever since was published in 1997 and I still agree with the large majority of things in it and I'm still inspired by them. And perhaps more importantly, I think they work. Here are 20 quotes from the book. A true professional feels no pressure to run up a client’s bill, knowing that any reduction in revenues caused by being efficient will be more than recompensated by the reputation earned for being honest and trustworthy. Truly visionary (and successful) companies have discovered that there is no conflict between the pursuit of profit and having a pursuit beyond profit. Professional is not a label you give yourself – it’s a description you hope others will apply to you. Stop teaching students that they are the best and the brightest. The noble path does win but only if you are prepared to make the investment over a long period of time. Focus on being the best you can at what you want to do. Success comes from doing what you enjoy. If you don’t enjoy it, how can it be called success? What is important is what inspires persistence and determination- in other words what you care about. When did you feel most fulfilled? When did you impress yourself, or otherwise feel most proud of yourself? More than any other factor, it is the people we have to deal with that determine the quality of our work lives. What you do with your billable time determines your current income but what you do with your non-billable time determines your future. No one can manage you if you don’t give them permission to do so. But if you are interested in accomplishing as much as you are capable of, then I believe there are good reasons to grant that permission. Before a leader can be accepted, let alone succeed, autonomous professionals must agree to be influenced by that person. Your task as a leader is to help others to succeed, not to strive only for your own success. If I don’t trust your motives, nothing else will matter –because my primary concern is your integrity. I will accept your influence, guidance and direction if (and only if) I believe that you and I share similar goals. I will not accept your guidance and critique unless you are supportive and nurturing. On the other hand, you need to be continually demanding. Whether or not your values are operational is crucially determined by whether or not there are consequences for noncompliance. If your clients aren't actively telling their friends about you, maybe your work isn’t as great as you think it is. I hope you'll like them. Do let me know which you find most useful.